I know it's been a very long time since some of you have heard from me. I hope you'll accept my apology. If you signed up for Bully For You! back when it first started you may have forgotten that you subscribed and are scratching your head wondering why you're getting this email and who it's from. So, let me explain and re-introduce myself. My name is Gale Henrard and a little less than 4 years ago I started The Proper Pit Bull website. And, some months later, I sent out the first few publications of the site's ezine--Bully For You! Little did I know that my life was about to take a sharp detour. With the loss of my husband's business and the illness of a family member, it became necessary for me to place my callings and passions on the back burner for a time. I had no idea it would take so long to get back to something resembling normalcy. With such a long break in publication, I realize that some of you may no longer be interested in receiving this ezine. I am sorry to have lost you. But, I do understand. You will find an unsubscribe link near the bottom of this email. But, for you bully lovers who are still interested in a monthly ezine, I hope you'll stay with me. I've learned a few things--like writing issues in advance--to avoid having production fall apart when life throws me a curve ball. And, I'm truly excited about the future of this zine. Each month, I'll share positive stories I've found about our favorite dogs. There will be at least one feature article that is exclusively for Bully For You! subscribers. Plus there's a Quote of the Month and updates about The Proper Pit Bull website. To those of you who choose to stick around, thank you for giving me another chance to do what I've wanted to do all along--share my passion for pit bulls with people like you. You can send your questions, comments or suggestions for this zine here. D-boy, The Miracle Dog, Survives--Shot Three Times While Protecting His Family! Wally, a deaf pit bull learns American Sign Language. Has your dog got the Pit Bull Blues? Check out this fun video. . . .Alot actually. I redesigned the site last fall with a new look and feel. And, a number of pages have been added--probably too many to list here. But, by far the biggest new feature is an interactive platform that allows you to share pictures, stories and comments. For example, you can now create a web page for your pit bull at our pit bull pictures page. No knowledge of html is needed. It's so easy that if you can send an email, you can do this. Be sure to check out the pages other visitors have submitted. And, of course, add your own. Do you have a question about training, behavior, BSL or something else related to owning or adopting a pit bull? Now, you can ask a question and get a personal reply at the Pit Bull Community Q & A page. This is a brand new feature. So, please bring your questions (answers are welcome too). You'll be helping others while you get your own questions answered. You can also join in on a discussion about a current news story, share your thoughts on feeding raw food to your dog or whether pit bulls are dangerous compared to other dogs. If you haven't been to The Proper Pit Bull website in awhile, I hope you enjoy the new additions. You can let me know what you think by using this contact form. Perhaps you're considering adding another dog to your household--either permanently or as a foster. Or maybe you're getting ready to live with someone who also has a dog. Then again, you might just want to be able to take your dog with you when you visit friends who have a dog. Pit bulls were at one time bred for dog fighting. And, some pit bulls do have dog aggressive tendencies. So, it's understandable if you're a little nervous about doggie introductions. But, don't let that stop you from making the effort. Not all pit bulls are dog aggressive. Dogs like people are individuals. Some show great tolerance for fellow members of their species--others not so much. Some pit bulls are never as happy as when they have a playmate to romp with or a buddy they can cuddle up with. Others prefer not to be bothered, but can be polite as long as the other dog behaves well. And, still others seem to perceive every other canine as a threat and every meeting as a show down. If your dog ranks 11 on a dog aggressiveness scale of 1 - 10, you're going to need assistance beyond the tips you'll get from an article like this one. You'll want to enlist the help of a behaviorist. But, assuming your dog is among the majority of pit bulls who will at least tolerate other dogs, the following tips can help the introductions go more smoothly. 1. Check Your Expectations. Just because your bully has made friends with dogs in the past, doesn't mean he'll like the dog you are introducing him to now. Some dogs are actually quite picky about who their friends are. They like some dogs and not others for no humanly discernible reason. But, dogs have very complex social signals that they understand perfectly well. Respect that and don't try to force two dogs to interact if one or both behaves fearfully or aggressively. 2. Arrange the First Meeting at a Neutral Place. That is a place that neither dog would consider its territory. This will lessen the possibility of spats over turf issues and possessiveness. The other dog should be handled by its owner or someone it knows. Both dogs should be leashed. 3. Create a Calm, Casual Tone to the Meeting. If you are anxious, your dog will sense it. So relax. Some dogs get excited the minute they see another dog. If this is how your dog reacts, don't yank him away--but gently re-direct his attention and walk him past the other dog from a distance. Make several passes by the other dog decreasing the distance as your dog calms down. Check out the additional tips in this article about dealing with an excitable dog. While the excitement dogs often exhibit when meeting each other doesn't necessarily signal aggression, it can trigger aggression if allowed to escalate. So, it's important to have both dogs relatively calm. And, unlike humans who tend to greet each other face-to-face and head-on, dogs prefer to be approached slightly from the side. 4. Take a Walk Together. Going for a walk does two things at once. First, it diffuses the intensity of the meeting by giving the dogs something to focus on other than each other. It also promotes a "pack mentality". But, don't try to walk both dogs yourself! Each dog should still have its own handler at this point. 5. Bone Up on Dog Body Language. If things are going well, at some point you'll want to let the dogs get close enough (while still leashed) to sniff each other and interact in earnest. A growl accompanied by a play bow is one thing. The same growl accompanied by a stiff body and hard stare is another. You probably already know that. But, there are more subtle signals that dogs give off that go unnoticed by most humans. I think every bully owner owes it to themselves and their dogs to become reasonably good at reading dog body language. As a starting point, I can recommend this excellent book with lots of illustrations and explanations about canine communication. Check it out--Canine Body Language: A Photographic Guide Interpreting the Native Language of the Domestic Dog . What if your bully just isn't dog friendly? I have two thoughts about this that may seem contradictory at first. But, they are really not mutually exclusive. The first is to love and accept your canine friend for the dog he is rather than the dog you wish him to be. He may never enjoy "play dates" with other dogs. But, he no doubt has some wonderful qualities that you find endearing. Focus on those and enjoy him for the great companion he is. At the same time, if you avoid taking your dog out in public because you're afraid of how he'll react to other dogs, his behavior around other dogs will likely get worse, not better. This can turn a routine trip to the vet into a nerve wracking experience. And, since he won't be accompanying you on errands or other outings where you might take your dog, he'll have the added disadvantage of spending less time with you. The solution: get professional help. With the right training, the vast majority of dogs can learn to remain non-reactive to neutral dogs even though they will never be social butterflies. 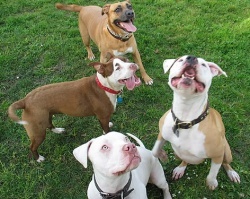 Do you have more questions about introducing your pit bull to other dogs? Ask your question at the Pit Bull Community Q & A Page and get a personal response. Coming Next Month: Can We Be Friends? Pit Bulls and Cats.